Ask a houser how his planned neighborhood improves on the old city and he will cite, as a self-evident virtue, More Open Space. Ask a zoner about the improvements in progressive codes and he will cite, again as a self-evident virtue, their incentives toward leaving More Open Space. Walk with a planner through a dispirited neighborhood and though it be already scabby with deserted parks and tired landscaping festooned with old Kleenex, he will envision a future of More Open Space. More Open Space for what? For muggings? For bleak vacuums between buildings? Or for ordinary people to use and enjoy? But people do not use city open space just because it is there and because city planners or designers wish they would. — The Death and Live of Great American Cities, Ch. 5. I support locating the presidential library in Jackson or Washington parks with the reservation that it should add to the usefulness of the park. The best way to do so is not necessarily by adding park acreage. The library will have to be integrated into both the urban and the park environments. While the architects for the library bid indicated that proximity to transit was essential for adequate access to the library, they also stated that a 20 acre site was required, and used the site size of previous library campuses to make their case. Given that a sea of parking surrounds most other presidential libraries, I’m strongly suspicious of the bid’s motive for requesting such a large parcel and a covenant needs to be placed on any land transfer from the parks district disallowing the construction of any new parking. Jackson Park has many world-recognized attractions and a deep history including the Museum of Science and Industry, world’s fair monuments, fishing, large fields, tennis courts, basketball courts, an 18-hole golf course, driving range, beaches, lawn bowling, and a japanese garden. Even Yoko Ono is working to improve the park. Despite these attractions, the park is underused and has a history of neglect. I live right across the street from the park, yet I use it far less often than parks several miles from me. When I want to have a sense of open space, such as when I proposed, I go to the 39th Street Beach instead. Most of Jackson Park is difficult for surrounding neighbourhoods to access as it is surrounded by highways, especially Cornell Drive. Cornell Drive is not only dangerous and difficult to cross by foot, but its vehicle noise disrupts the serenity that one would wish to have in the park. It overwhelms the peaceful noise of water, birds, or leaves when I visit the japanese garden. Cornell Drive became a monster road in 1965 under the pretext of safety while sacrificing pedestrian access and 10% of the park’s trees. This was certainly not part of Olmstead’s vision. I specifically mentioned in my testimony at the public hearing that we should use the opportunity provided by the presidential library to remove Cornell Drive from the park. The removal would more than offset any loss of parkland the library would cause. Otherwise, the library would occupy one of the few sites in the park one doesn’t have to cross Cornell Drive to access. An editorial in the Chicago Tribune suggested that Cornell should be relocated underground, but I believe removing the drive is feasible and much less expensive. 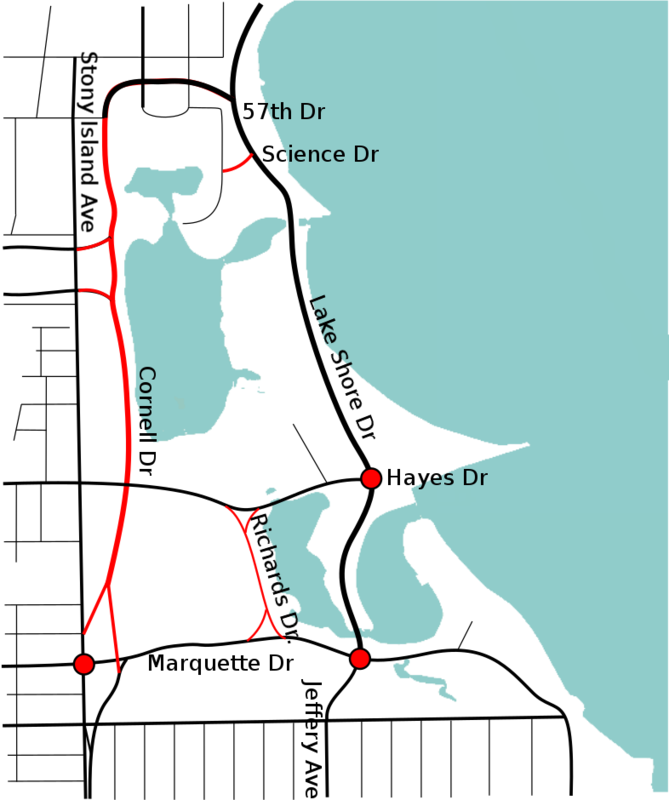 In several previous plans and reconstructions of road through Jackson Park, the option of closing Cornell Drive had not been considered. IDOT considers Cornell a ‘Strategic Regional Arterial’ and produced a report examining construction options in 1996. This led to a full reconstruction of Lake Shore Drive and other roads in Jackson Park in 2002. In the 1996 report, the barrier created by traffic on Cornell Drive was recognized, but no proposal to remove this barrier was considered. Rather, a proposed relocation of Cornell Drive onto a widened Stony Island was proposed that would have separated even more of the park from the community. This report emphasized ‘Improved traffic operational efficiency’ as a key goal, and would not have considered road closure an option. Roadways through Jackson Park have Average Annual Daily Traffic counts as shown below measured in 2010 and 2013 by IDOT. I propose the roadway closures and modifications to the intersections shown in red below. Proposed roadway closures to improve park access. The intersections marked with red dots would require modifications as described in the text. These changes would calm traffic on all roads through the park except Lake Shore and Marquette Drives. On these two drives, traffic lights are removed and access points limited in order to maintain adequate road capacity. The intersections of Lake Shore Drive and Hayes may be either closed or made right-turn only. The parking lot on the east side of the intersection should be closed. Marquette between Stony Island and Cornell would become westbound only with two left turning lanes and a third left or right lane. Through movement would not be permitted in order to calm Marquette Road west of the intersection so that it may continue to be used as a bike route. A new 25 mph curve would be constructed from northbound Cornell onto eastbound Marquette. Capacity along Lake Shore Drive between Marquette and 57th would need to be increased. This segment did handle 53800 vehicles in a day during the 2006 reconstruction of the Dan Ryan expressway, demonstrating sufficient capacity to handle 50%-75% of the traffic currently on Cornell with the existing road configuration. As mentioned in the 1996 IDOT report, traffic volumes were limited by traffic signals at 57th and Marquette, not by the road width. With the removal of some traffic lights, an increase in green time for through traffic at 57th, and a right turn only restriction from westbound Marquette at Lake Shore Drive, there should be sufficient capacity to fully handle the diverted volume. 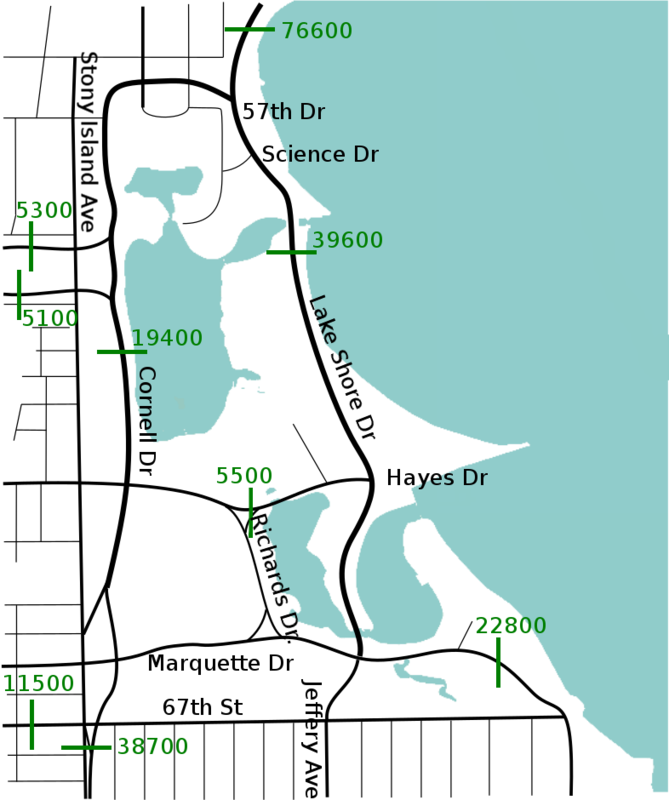 The additional traffic volume along Marquette would necessitate the installation of new grade separated pedestrian crossings for the Golf Course and on at least 3 of 4 sides at Lake Shore Drive. While this proposal would strain the available capacity of Lake Shore Drive through Jackson Park, it is fairly cheap to implement and would have immense benefits to park users. Who would lose out in such a reconstruction? Drivers continuing down Stony Island will no longer bypass queuing that occurs during rush hour at the intersection with Marquette. Traffic currently accessing Lake Shore Drive from either 63rd or Midway Plaisance would have to divert a short distance on Stony Island before accessing a fast arterial. Commuters between the University of Chicago and Indiana would no longer be able to cross the intersection of Marquette and Lake Shore Drive and may find it easier to take the Skyway instead. Vehicles travelling west from the South Shore neighbourhood would have to use city streets instead of cutting through the park. Some traffic will also divert onto the north to west left turn at 57th Street likely beyond its current capacity. Finally, developers of the old US Steel site would have an even more difficult time glossing over their transportation plan. Mind you, their site transportation plan is filled with problems anyways, a topic for a future post. This entry was posted in Automotive, Walking. Bookmark the permalink. I don’t think you’ve made the case for increasing the capacity of any road. The capacity of the roads are not defined by their lanes, by their historical traffic counts, or by the count of cars on the roads that would be closed. I think this statement also discounts the ability of purposefully decreasing the capacity of road segments to reduce the demand to travel on that road. I think we’re in agreement that the road network around and through Jackson Park can be changed to improve access to the park while maintaining reasonable mobility for drivers choosing to use the roads in and around Jackson Park, and that removing Cornell Drive is pat of this change. It’s true, there is an implicit assumption in my sentance that existing vehicle volumes should be maintained if possible, and it’s an assumption that I deliberately want to have in this analysis. It is much easier to sell a road closure to car-centric local ward politicians, traffic engineers, and buisiness people when vehicle flow is considered one of the priorities. There is a case to be made for reducing vehicle flows on Stony Island, Jeffery, and a very strong case for keeping volumes low on South Shore Drive. This is a different battle, and one I plan to address in an upcoming post. Yes, directly across from Jackson Park. The point of this article is to show that life can be dramatically improved for those using the park while continuing to provide roadway capacity. This isn’t going to make life miserable for anyone, even though many will claim it does. I have lived in South Shore & HP since 1967, this is one of the worst ideas ever, all you need is one car accident on the Drive, and guess what folks can’t really get home going past 57th Street. Again a TERRIBLY DUMB IDEA for those WHO RESIDE, and own property in the community. What problem currently exist with using the largest park in Chicago, which happens to be Jackson Park. “The point of this article is to show that life can be dramatically improved for those using the park…” Really? And says who? I’m glad that your interested in this topic, but please keep it civil and read the article. It answers most of the questions you’ve posed. Regarding collisions, which the article only implicitly addressed, this proposal closes none of the major access points to Lake Shore Drive. In case of a collision, no one is any more stuck than they would be today. I will be civil, sadly the article is Pie in the Sky and not at all realistic. Sadly I have seen plenty of accidents that have backed up the Drive and Cornell. Moreover, there was a 4th of July a few years back where the city had Fireworks on 63rd, and Pres. O was in town as well and guess what, Cornell was Blocked off and it took me an HOUR to get from 57th and Stony to 67th and Oglesby, as I had to go West to MLK, go to 79th, then to Yates and back to 67th. Now that was instead of the normal 3 MINUTE Dr. So I’ll attempt to remain cool, but the questions are not answered and life will be more inconvenient. Hey, no worries eventually those who once resided in SS will get it back. That’s really the goal anyway, gotta love gentrification. Oh I read the article not much there, Leslie Hairston seems to be against, not firmly. Yet she certainly knows the deal, as she lives a few blocks from me. Since you seem interested, I’m curious about your thoughts on another topic that I had meant to make a post on: the development of the US Steel site and its effects on South Shore. That’s what most worries me about balling up traffic.